2 What are the Keurig Rivo features? The Rivo system is a modern extremely functional coffee brewing unit that perfectly fits any household or office because each Keurig’s product can be used for commercial purposes. Keurig can be called one the most awardable coffee equipment corporation in the world ― it counts more than five awards of different fields. And this fact is predictable because Keurig never runs off the experiments and innovations. Rivo is a unique single-serve technology that works with espresso beverages and was developed to brew perfect coffee at home. System uses special capsules that are not compatible with any other single-serve coffee machine as of Keurig or of another manufacturer. 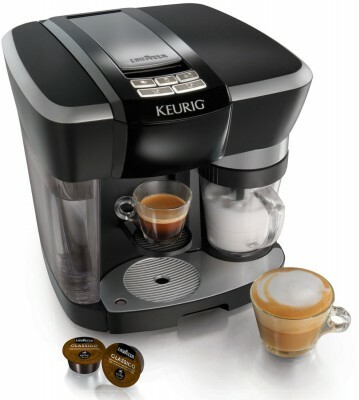 What are the Keurig Rivo features? As you can see Keurig Rivo System has rather large dimensions, that’s why if you are owner of the small kitchen, think before purchasing the unit. Maybe it would be better to buy Pixie or Mini Me coffee machines. The milk frother is one of the greatest advantages of this system. Really, Rivo works with any type of milk: milk itself, skim milk, almond, coconut milk, soy. So, even those people, who lactose intolerant can get a cup of perfect cappuccino without any complicacy. Of course, if you froth coconut or almond milk you’ll get less foam than with just milk, but it is a feature of the regular milk, not the frother. Keurig Rivo machine has a traditional for the most part of single-serve coffee machines power of the pump pressure: it’s 15 bars. 15 bar. is a perfect pressure for real espresso brewing and it’s used in many professional coffee machines exploited in different coffee houses. With such pump work, you can get the classical espresso with its specific crema. The system will save aroma and flavor of any bean contained in the capsule and put them fully in your cup. Functionality is one of the most powerful sides of the unit. 5 buttons on the top of the Rivo body open limitless possibilities of coffee brewing. You can easily switch between mug size (one or two espresso shots). You can also choose the type of beverage you want (espresso, latte, cappuccino, some iced and cold drinks). There are no limits ― you can get anything you want in short time. By the way, the time of brewing is one more feature of the Keurig Rivo. Time of brewing is one of the most popular criteria used to choose the coffee machine. Modern life dictates its own speed, and very often we short of time just for the coffee break. That’s why, yes, it’s important how long coffee machine brews a mug of the drink. time of brewing: about 1 minute. One minute for a cup of perfect, coffee house style cappuccino. What do you think? Yes, it’s amazing! Positive features of Keurig Rivo are really impressive, and, definitely, they can make a particular influence on your decision. But don’t be in a hurry. There are some unpleasant peculiarities, which also have to be mentioned it the review. Keurig Rivo has a quite high price for the coffee machine of its class. The price changes between $150 and $200. Well, in comparison with other pod systems for home use, the cost is too high. If you are tight in budget, it’s better to find something more attainable, because below we will light another con of Keurig Rivo. price of the box: ~$15. If you are not keen about the great range of coffee types, than maybe it will be reasonable to choose not capsule coffee brewing system, such as Mr.Coffee Espresso Making Machine ― very useful and functional device. Availability is the greatest con of the Rivo system. You can not purchase capsules in regular stores, such as pods of Nespresso or Dolce Gusto. Keurig sells its products online and that’s a pity. Be ready to the situation when you won’t be able to get your box of capsules now and here. Most of the Keurig owners got used to waiting for their capsules. Well, Rivo is the very interesting system for home coffee brewing, but before purchasing the unit think, if it fits you fully. Check if you are ready to wait for your box of coffee and pay for each cup.